Spring is the busiest time when it comes to planting and gardening. That includes garden crafts! Add a fun twist to gardening by using product containers from around the house to make planters and other fun garden creations. Need a little inspiration? 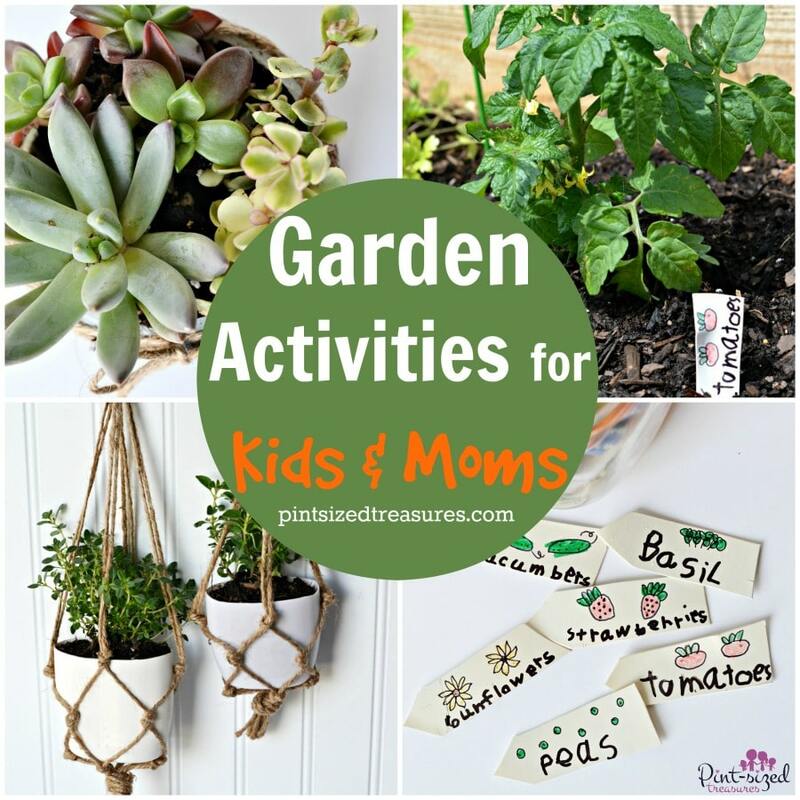 Keep reading for three creative garden activities for kids and moms that can be made from a plastic container. You’ll be using your green thumb while practicing being “green”. Recycling shouldn’t be seen as just another household chore; showing your kids how to recycle can be one of life’s little teachable moments that can have a BIG impact. Everything from shampoo and mouthwash bottles to soap and bandage boxes can be recycled. With a little creativity, many of the items that can’t be recycled could still be repurposed into something useful. Recycling and reusing are two of the important R’s when it comes to creating a healthy planet for our kids and future generations. I love turning something old into something brand new! It’s truly amazing what you can create from products that once served an entirely different purpose. That’s just what we did with these three activities — lotion bottles transformed into hanging herb gardens, a make-up container became a succulent garden, and a plastic container was used to create oh-so-cute garden markers. Next time you think about tossing an empty container — stop! 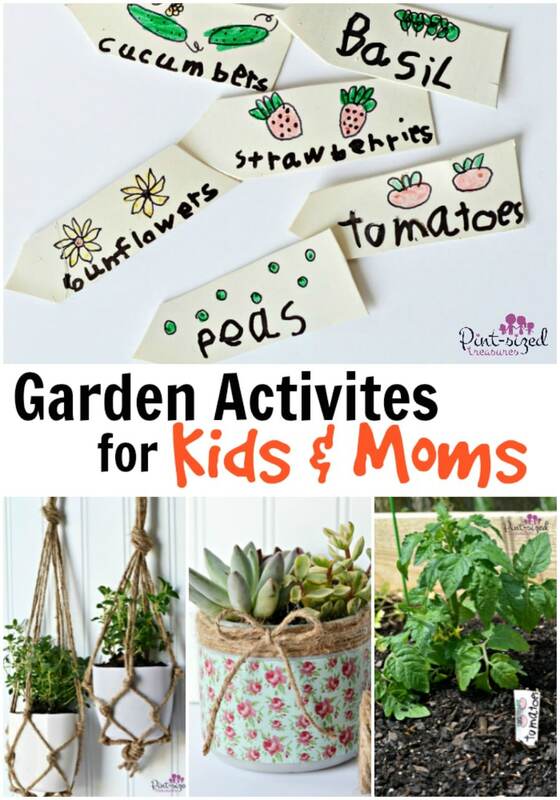 Turn it into one of these fun garden creations that kids and moms of all ages will appreciate. These hanging planters are an impressive project to create, and they can be completed in just a matter of minutes. Don’t get overwhelmed. They are easier than they look. If you can tie knots, you can make these fun hanging planters. Peel off any stickers from the lotion bottle. Use scissors to cut off the top of the bottle. If the bottle doesn’t have a label that can be peeled off, you can apply a few coats of spray paint to cover up any labels. Set your bottle to the side. Cut 8 long pieces of twine and tie them together at one end. Separate the pieces of twine into pairs. Stretch each pair out from the knot in a different direction. Tie adjacent strands together a few inches from the base knots. Fill the bottle with soil and a small plant. Herbs or succulents are a great option. Slip the bottle and plant into the twine basket. Tie all of the the strands into a knot once more above the plant. Repeat these steps to make more than can all be hung together in a group. Succulents are so easy to maintain. That’s what makes them ideal for both novice and expert gardeners alike. And they can be planted in almost any type of container. For this craft, we simply took an empty cleansing pad container and added a few embellishments to create an environment perfect for a few succulents. Peel off the sticker from the container. 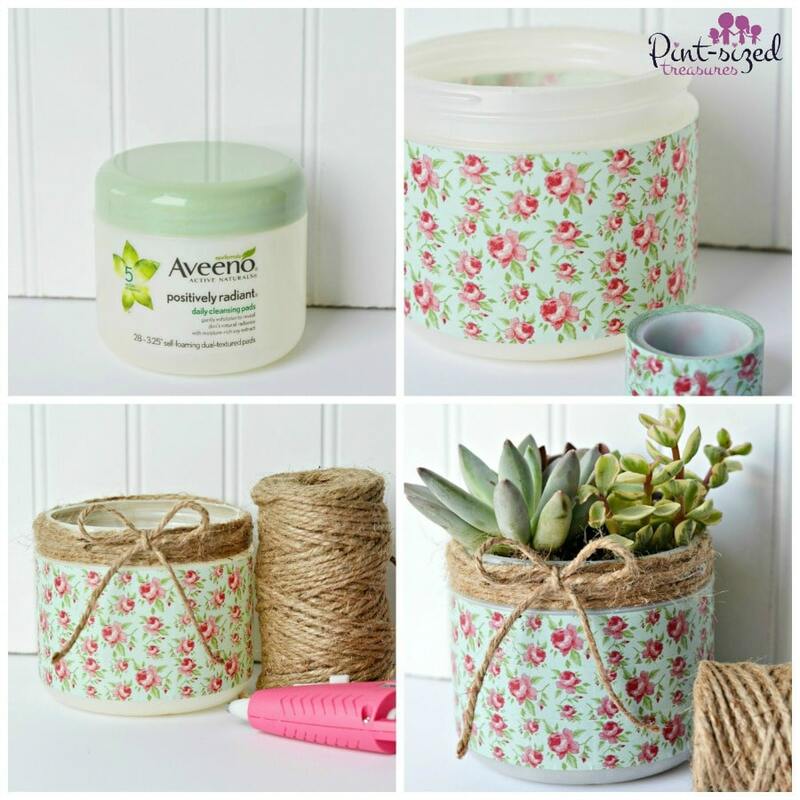 Decorate your container with Washi tape. Wrap twine around the top of the container where the ridges are. Use hot glue to secure the twine. You can even tie a bow from a piece of twine to secure to the front of the container. Fill your container with soil and add a few succulents. If desired, you can sprinkle pebbles on the soil around the succulents. Water your succulents by simply placing two ice cubes on the soil when it becomes dry. The ice will slowly melt and soak down into the soil. If you’re starting a garden from seeds, you’ll need markers to help you keep track of your sprouting plants. A simple label is all you need to remember which plant is which. For this craft, we simply cut out pieces from a plastic container to make markers that are both cute and practical. Wash and remove the label from a plastic container. A lotion bottle works great for this. Use the scissors to cut pieces from the bottle to serve as garden markers. If desired, spray a light coat of paint on both sides of the plastic pieces. Allow the paint to dry completely before moving to the next step. Write the name of each plant in your vegetable or herb garden on a garden marker. For some added fun, you can even draw a picture of the plant or crop. The kids will love this step! Make sure to use permanent markers, so your work doesn’t wash off when the garden marker gets wet. Place each marker near its corresponding plant in your garden. That’s it — three fun ways to use that green thumb while practicing being “green” around the house. Be sure to check out this cute video below that features one of the finished products!